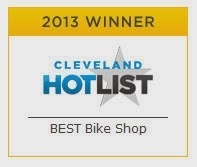 Century Cycles was the winner of the "Best Bike Shop" award in the 2013 Cleveland Hot List. Thank you to everyone who voted for us last year! There is ONE WEEK left in the voting for the 2014 Cleveland Hot List. We're in the running, but WE NEED YOUR VOTE! Please CLICK HERE to vote for Century Cycles. It's quick and easy! Thanks!